Prayer flags are made of colored cloth using one of the five colors of the five elements. There are many kinds of prayer flags each with their own prayers, mantras and images. Some prayer flags have a central image of an enlightened Being with prayers and mantras specific to that deity. Also common is the image of the wind-horse in the center and the animals of the four directions. The prayers and mantras are activated when the flag is moved by the wind. Although there are certain auspicious days during the year when prayer flags are traditionally raised, they can be put up at anytime in order to bring benefit. Generally, they are first consecrated and then raised in the morning outside at a sacred place or a place that is high such as a mountain. 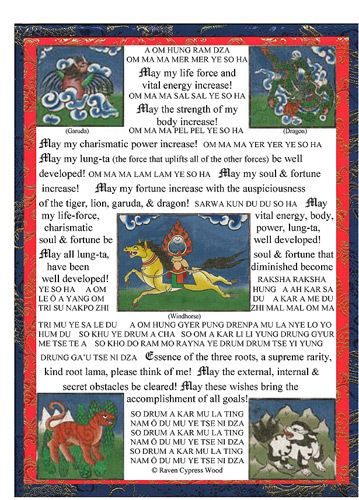 Posted on November 24, 2013, in Five Elements, Prayer and Ritual, Uncategorized and tagged five elements, healing, prayer flags, Tibetan culture, yungdrung bon. Bookmark the permalink. 4 Comments. Love the translations- do you have those printed? Yes. Some years ago I created a 8×10 laminated hanging with the Tibetan on one side and the English or Spanish on the other. I sold them as a fundraiser for Khenpo Tendar. If you’d like, I will send you one.